The reinforcing and rewarding properties of cocaine are attributed to its ability to increase dopaminergic transmission in nucleus accumbens (NAc). This action reinforces drug taking and seeking and leads to potent and long-lasting associations between the rewarding effects of the drug and the cues associated with its availability. The inability to extinguish these associations is a key factor contributing to relapse. Dopamine produces these effects by controlling the activity of two subpopulations of NAc medium spiny neurons (MSNs) that are defined by their predominant expression of either dopamine D1 or D2 receptors. Previous work has demonstrated that optogenetically stimulating D1 MSNs promotes reward, whereas stimulating D2 MSNs produces aversion. However, we still lack a clear understanding of how the endogenous activity of these cell types is affected by cocaine and encodes information that drives drug-associated behaviors. Using fiber photometry calcium imaging we aim to understand how the temporally specific information originating from these two cell populations guides environmentally appropriate behavior. Although both males and females become addicted to cocaine, females transition to addiction faster and experience greater difficulties remaining abstinent. Our recent work, using fast scan cyclic voltammetry, has shown estrous cycle-dependent fluctuations in both dopamine system function and cocaine actions directly at the dopamine transporter. Using fiber photometry, we aim to understand the consequences of these changes in cocaine effects on reward learning and subsequent cue responses. 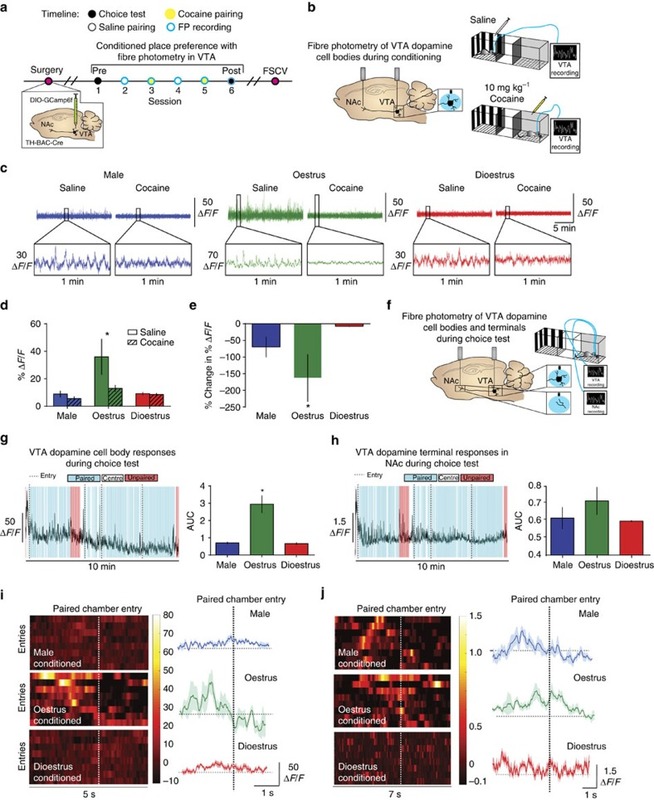 To do this, we have been recording dopamine-specific neurons during tasks to look at the neural response to cues and understand how this relates to drug seeking.